I think I’m in the right genus, but haven’t keyed it to species yet. Those curved anthers should make it relatively easy to distinguish from its kin. 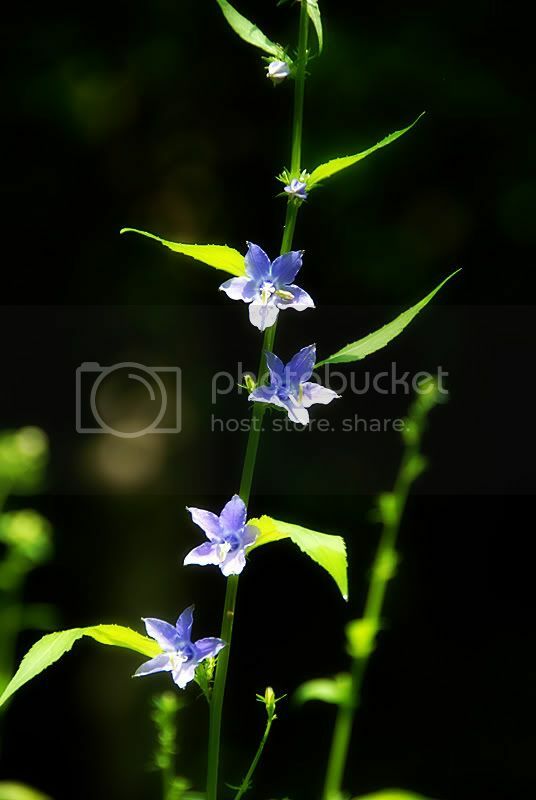 UPDATE: Thanks to Rurality for the dope slap and correct ID: American Bellflower.I had to shoot with the lens at 200mm because these were blooming up a steep shale bank at the end of the valley. The dynamic range from lightest to darkest was too great for the medium to capture so the highlights are blown; would have been a good time to take RAW and use Photomatix to balance light against shadow. But I was too lazy to think through this. I love bringing images back and posting them while they are still “warm” from the field, though it’s not quite as much fun having to upload blog-size and enlarged versions to Photobucket as it would be if I had a permanent place for them. Maybe this will happen soon. Sigh. It’s beautiful. I used to see those in Rural Retreat, along the side of a gravel road. See this link for a new photography toy… I think you’ll like it. Fred – beautiful pic………I recently upgraded to a Nikon D40x (the D200 is a bit out of my budget) – it came with an 18-55mm lens and I am absolutely enthralled with it – my macro shots are exquisite and I’m eager to get out & try the 55-200mm lens I bought………This replaces my 5700 & my 8800 – I need to try to sell these 2………I intend to keep my very first Nikon – a 3.2MP as I use it to shoot my grand-daughter as it fits in my pocket & she doesn’t see me taking her pics & the pics are so delightful………I wonder if our upgrades will ever end!!!!! !